The (cold) hard light of day | carpe diem! So there I was at the beginning of last week, ensconced in my corner of the couch, virtually surrounded by yarn and knitting books, almost enjoying my cold. I had the projects I was knitting, alternating hard and easy, I had the radio, books to read, with hot chocolate or a quick hit from New Style of Heirloom Knitting when I needed a bit of excitement. I’d been looking for a copy of that ever since I saw the Mondnacht Shawl (3rd down on the right on the link above), and recently found it at the NeedleArts Bookshop. I’d had a couple of accidents at Colourmart, one as soon as I had the Mondnacht pattern in my hot little hands and the second being the direct result of his standing over me chanting “Go on, buy it” while I was gazing longingly at this, which I’ll discuss another time. 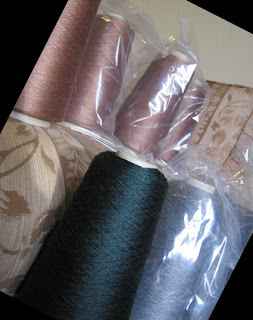 The Great Cashmere/Silk Invasion of Nov ’07. Each of those cones is 2500 yds. The angels have the phone box? Ha. The yarn has my living room. I was set, with a long list of projects to look forward to. Then I checked my email and found my sister’s reply to the perennial “Any idea what you’d like for Christmas?”. I’d sent a scarf and one of the Kiris in the Christmas box last year and heard nothing, so I’d filed knitted items under ‘possibly inappropriate’. I was therefore a bit stunned to read that she still loves her socks and he cherishes his scarf, and did I ever knit mittens? Perhaps they’d felt that asking for knitwear was too… forward? Pushy? Perhaps I should just be more generous. After all, I LIKE knitting. I think I’m becoming a process knitter. And what does a knitted gift tell the recipient? It says “I care enough for you that I spend time, precious irretrievable seconds, minutes, hours of my life making stuff for you.” Even if the recipient doesn’t get that message (I know some people don’t), the important thing is that you’ve said it. I went back downstairs, pulled back the curtains of my mind, and looked hard at what I was knitting and what I planned to knit. 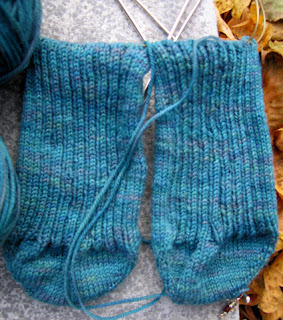 The travelling socks will be a gift, but I haven’t been rushing it; I’d cast on the handspun for socks for himself. Other than that? All for me. My conscience stood up and kicked me, hard. There are many patterns I’ve looked at and thought: interesting, but I’d never wear it. Gloves, scarves, winter hats. Mittens. How self-centred I’ve been. I am. I will not be. I’m set, with a long list of projects to look forward to. And none are for me until I finish and post some gifts. Because I’ve finished the Gairloch Socks! 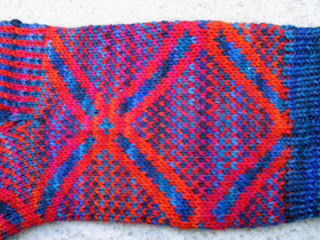 Based on a traditional pattern from Gairloch, Scotland. Inspired by a dream, knitted in Wollmeise sockyarn, Indisch Rot and Gewitterhimmel. Sole on 2mm, instep/leg 2.5mm, 68st circumference. This is my second stranded knitting project and the first where fit really matters. And they’re nearly too small: I hadn’t realised how much the stranding reduces the elasticity of the fabric, and I hadn’t considered the bulk that stranding adds to the fabric. I must remember to add c. 6st to the circumference to allow for these factors. The colours are roughly accurate on my monitor: these socks are bright! 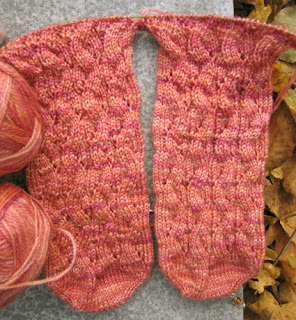 Sockbug’s River Rapids socks in Woolen Rabbit ‘Copper Rose’ Merino/Tencel, (2mm sole and instep) followed by Dream in Colour, sorry, Color Smooshy in Blue Lagoon 2mm sole, 2.5mm instep. Simple 2×2 rib on the instep, but I may do something silly with it on the leg. Drunken cables? And perhaps some ornate ribbing. This is an amazing book! I also have yarn and patterns for mittens and, if time, hand- and arm-warmers for all and sundry. Wing o’ the Moth is my reward for knitting a minimum of 1.5″ of sock. Fiddlesticks (Jaggerspun) Zephyr in Sage, on 3.5mm needles so I’ve added two pattern repeats to Chart A and some messing about in the reverse stockinette band to give me an extra repeat of Chart B. This is a nice yarn, warm, bouncy, light glinting on the silk, but it feels a bit… dead? in the hand. I think washing may help. Perhaps you’ll find this exciting. Buying stuff online is a bit of a lottery as regards colour. I usually win, especially with Lisa Souza, but ‘Sea Glass’ proved much brighter and more blue-green than I’d expected. Originally intended for the Moth, it sat in the stash for over a year. Each time I saw it I measured my desire to over-dye it against my abysmal ignorance of dyeing and then, last month, I had a brainwave. Dee’s colours are amazing. Why not ask if she’d do it? She said yes. 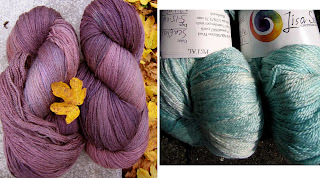 I sent a long list of the colours I’d loved (a list I didn’t like would have been shorter). The end result is utterly gorgeous. It’s purple and plum and grey with touches of bronze. It’s the colour of heather and gritstone and storm. It’s going to be a Kimono Shawl (I think). When I finish the Christmas knitting. I still have the cold. It’s just sniffles and a minor sore throat now, but still… THREE WEEKS. * As in ‘unallocated to another project’. To be fair I have to add that qualification. This entry was posted in Uncategorized on November 12, 2007 by sarahw. You’ve been quite busy, with your lacy this and socks that! The overdye turned out brilliantly, by the way.Hope those sniffles depart sooner rather than later. I think it is the season for lots of things on the go and looking around we don’t seem to be the only ones. You seem to be in control of yours though, they all look lovely and are making good progress despite (or maybe because of) your cold. 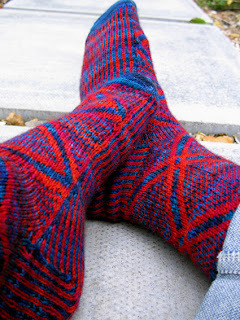 Perhaps if I could have a FO as beautiful as those Gairloch socks it may spur me on a bit! Your Gairloch socks bring blasts of highland memories! I will let you know how the Bearfoot goes! Well, if you have to have a cold, it looks like you’re using your time wisely. 🙂 I’m very impressed by all the activity over there. 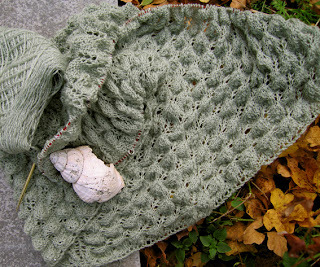 There’s no way I could keep up!Regarding oiled yarns on cones, I’d recommend washing it first, before knitting. They can bloom something crazy, and I don’t really like knitting with something that smells like machine oil, but who knows, maybe it smells better in the UK?! Wash the swatch and see before you commit to 2.5mm – that colourmart stuff can totally transform with washing. And the re-dyed yarn is absolutely beautiful. All the socks are lovely. 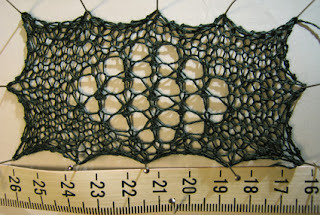 Do you use the magic loop method to knit them or two circs? Hullo Anonymous!I’d have emailed you if I knew who you were 🙂The Gairloch Socks were on 2 circs to get the soles tighter than the instep; I switched to magic loop for the legs. The River Rapids are on 2 circs because they’re what I had in the sock bag when I cast one; I’ve been too lazy to dig the long 2mm needle out! The Smooshy socks are on two circs as well; I don’t know if I’ll switch those to magic loop or not – depends on what else throws itself on the needles when I finish the River Rapids. I really should be mittens. I must be strong!